Though West Virginia is called the “Mountain State,” where “mountaineers are always free,” it might make more sense to call it the “forest state” — since 75% of its land is covered in trees. Some of these trees have given us a tasty autumnal addition in the Golden Delicious apple, first grown in Clay County. West Virginia also boasts the oldest population of any state, with its median age being 40 years old. Perhaps the good people of West Virginia knew a good thing when they found it and just never moved…or maybe the sulphur spring in Greenbriar County is really a fountain of youth. Ever heard of the Greenbriar Resort? It’s a throwback to more genteel times, when you had to “dress for dinner” in jackets and skirts. A luxury resort, people have been visiting here since 1778 to “take the waters” of the sulphur spring. Sulphur springs have been used since Egyptian and Roman times to ease aches and pains like arthritis and cure a variety of skin diseases, including psoriasis and dermatitis. Want to know the downside of soaking in a relaxing sulphur bath? That would be the smell of decaying rotten eggs. Doesn’t that just sound delicious? In an effort to enjoy all that West Virginia has to offer let’s skip the egg bath and instead pour ourselves a Gold Rush as a nod to the Golden Delicious apple. 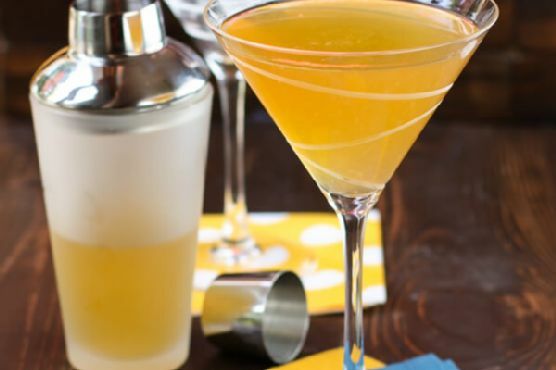 Combine vodka, frozen apple juice concentrate, Calvados and fresh lemon juice in cocktail shaker; add ice. Cover and shake well. Strain into Martini glasses and serve.